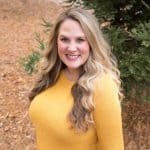 Fall off the bone tender Paleo + Whole30 BBQ Ribs. Made in the instant pot in under an hour! The BEST ribs you’ll ever have! Gluten free, grain free, dairy free, refined sugar free, clean eating, real food. THESE ARE THE BEST RIBS I’VE EVER HAD! Sorry for screaming at your eyes. But OH MY GOD! Stop everything you are doing right now and buy all the ingredients you need to make these ribs and make them once a week until summer is over. If you’re like me, the idea of making ribs seems intimidating. But these are so insanely easy and come out perfect every time! Best part? They’re ready in under an hour! All thanks to my new best friend, my Instant Pot. 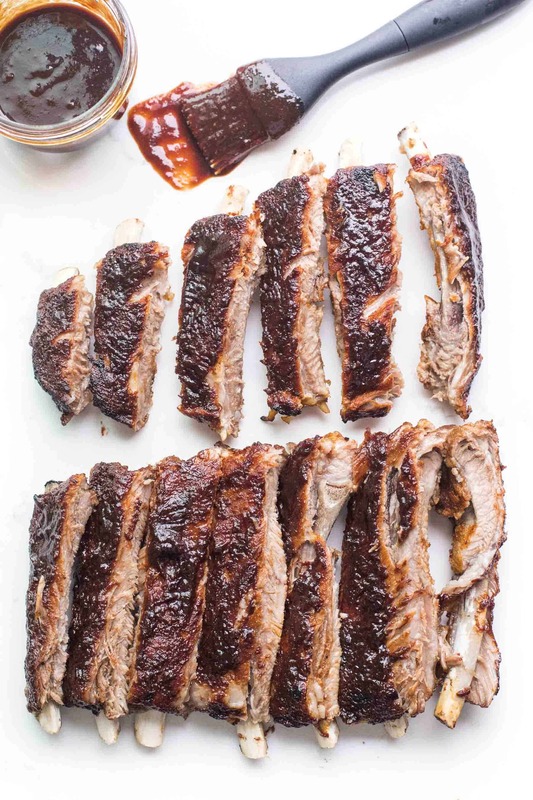 You rub the ribs with a dry rub, then put them in the instant pot for 25 minutes. 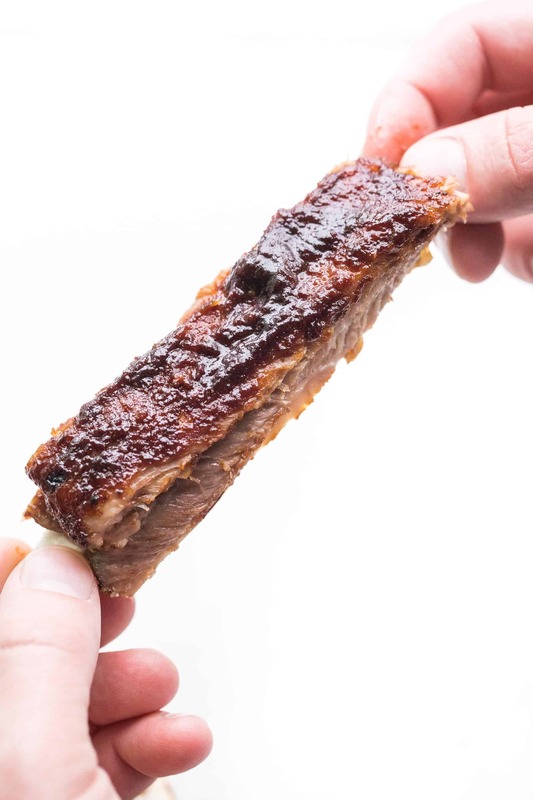 25 minutes is the perfect amount of time for tender ribs that fall off the bone, but still have the tiniest amount of chew to it. Then you brush the ribs with bbq sauce (I love my homemade whole30 version the most! ), and broil them for 5-8 minutes in the oven. This gives the ribs that caramelized char. You could also finish them on the BBQ, but honestly the oven is a whole lot easier and just as delicious. I find the ribs tend to stick to the grill, and I don’t want to waste any meat here! Can You Put 2 Racks of Ribs in the Instant Pot? I have the 6 quart Instant Pot, and I could easily fit 2, even 3 racks of ribs in there. If they ribs are touching it’s ok. You just want to put them in vertical, so the rib bones are going up and down. I get my ribs from ButcherBox (which I highly recommend! Best hormone and antibiotic free pork!). 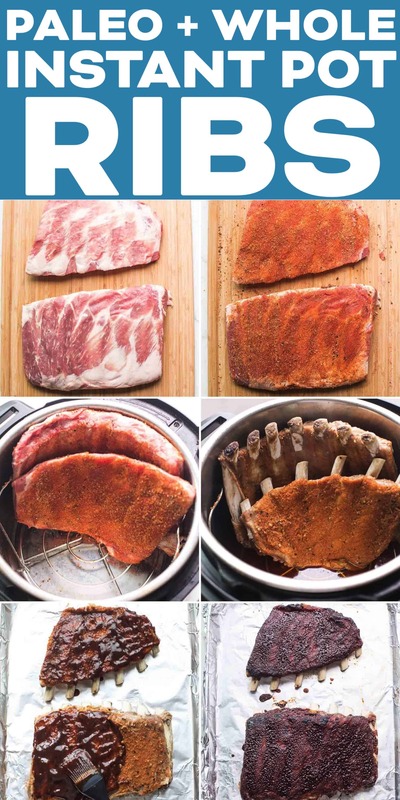 The rack of ribs are already cut in half, so they easily fit in the instant pot. If you have a full rack, you can curve them to fit inside but I recommend cutting them in half for easiest handling. The ribs are going to be extremely tender when done cooking, and taking a full rack out without it falling off the bone can be tricky. 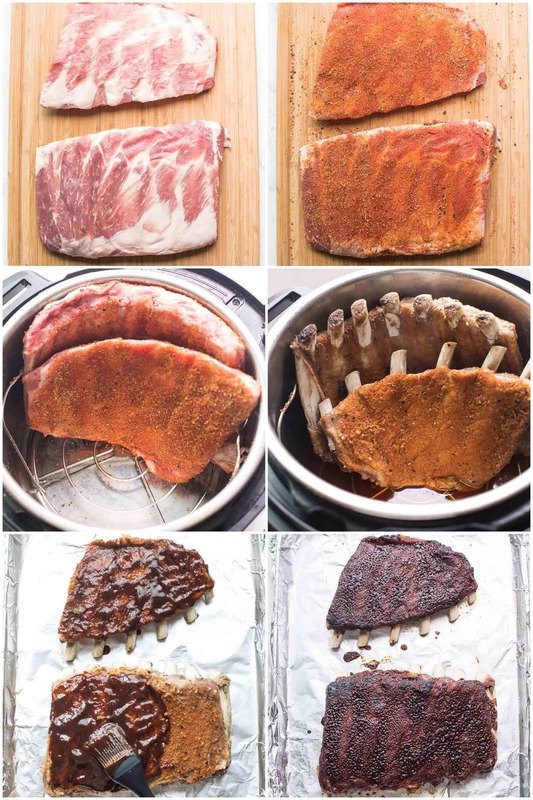 No need to adjust the cook time if you’re cooking more than 1 rack of ribs in the instant pot. It will still be 25 minutes, with a 15 minute naturally release of pressure. 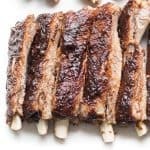 Can You Cook Frozen Ribs in the Instant Pot? 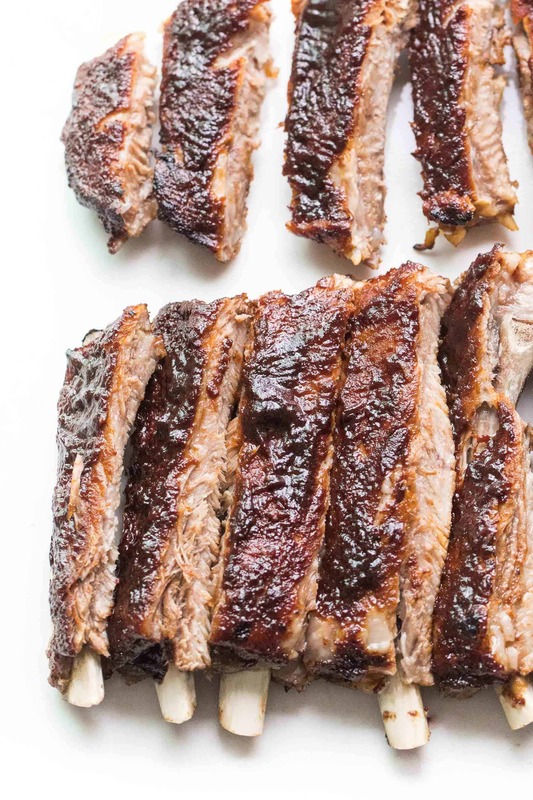 If your ribs are already frozen, you can cook them straight from frozen in the Instant Pot! Just increase the cooking time to 35 minutes, with a 15 minute natural release of pressure. However, you’ll want to make sure your ribs are already cut in half so they will easily fit inside. The full rack of ribs won’t curve when frozen. Also, make sure the ribs aren’t frozen to each other in a huge block. If they’re frozen together and touching, they won’t cook evenly. 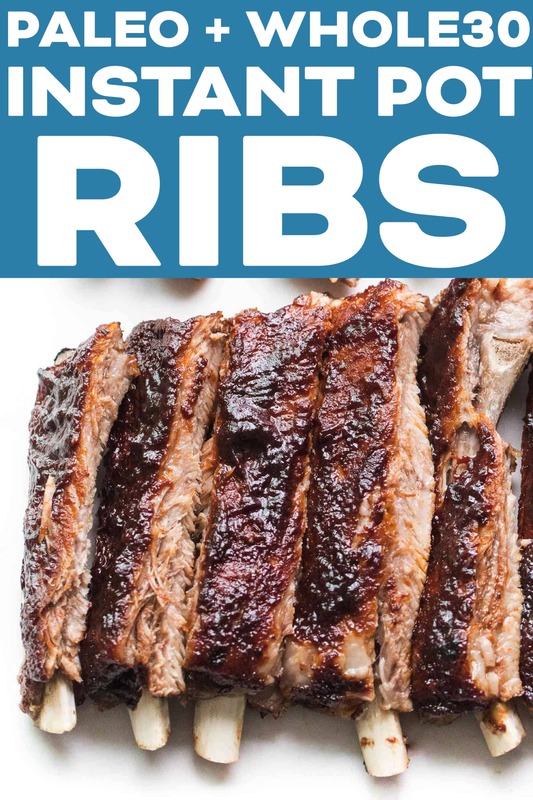 After you take the ribs out of the oven (or off the grill), allow them to cool for 2 or 3 minutes. Then, using a large chef knife cut each rib for easy serving. 1 rack is enough to serve about 4 people, with each person getting 3 ribs. 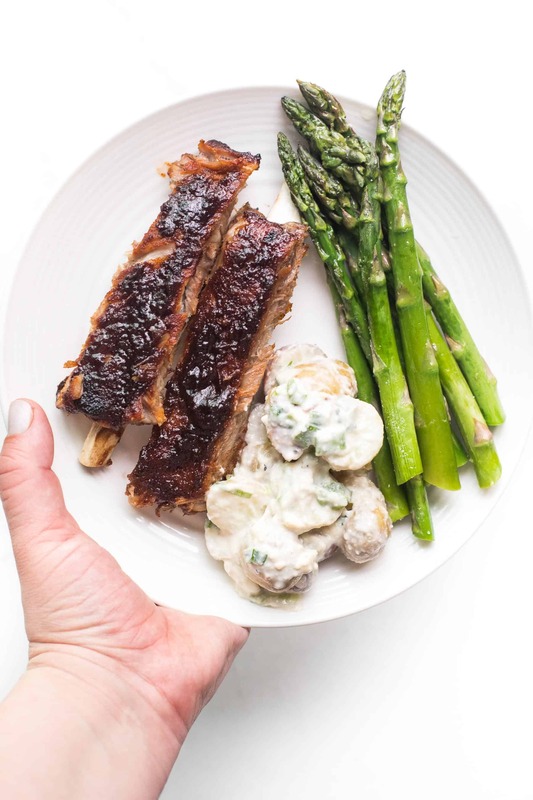 I love serving my paleo + whole30 ribs with extra bbq sauce, my paleo + whole30 creamy potato salad (recipe coming soon! ), and asparagus. My favorite summer dinner!